To fulfill the demand of High Power PoE for network applications with Fast Ethernet speed transmission, PLANET 802.3at PoE Fast Ethernet Switch – FSD-808HP is an ideal solution. 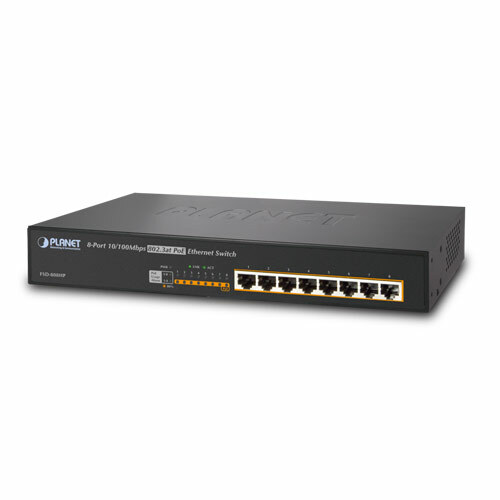 Each 10/100Mbps port of the FSD-808HP features IEEE 802.3af and High Power IEEE 802.3at Power over Ethernet (PoE) that combines up to 140-wattspower output and data per port over one Cat.5E / 6 Ethernet cable. 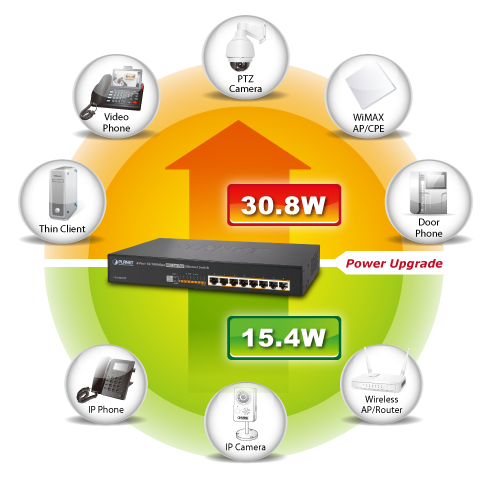 With totally 140-watt PoE budget on the whole system, the FSD-808HP is designed specifically to satisfy the growing demand of higher power consuming network PD (powered devices) such as PTZ (Pan, Tilt & Zoom) / Speed Dome network cameras, multi-channel (802.11a/b/g/n) wireless LAN access points and other network devices by providing double PoE power, more than the current conventional 802.3af PoE.